Today, we are going to tell you about the Top Best Hindi Blog, which has made its mark on the internet through its blogging. If you are a blogger then you must have searched on Google sometime or the top Best Hindi Blog. 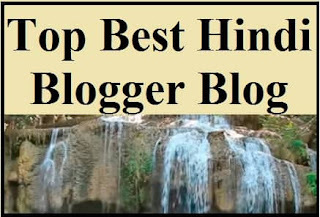 But the thing to say is that in every Best Hindi Blog List, you are told about just a few select blogs, but we can tell you that there is the number of Hindi best bloggers on the internet who have given information in Hindi on the internetwork. When someone starts blogging, he definitely finds the Best Blog List on the Internet. When I started blogging then I also tried to go about Top Best Hindi Blog and then I came to know that everyone has told about some blog and only then I had thought that Research on Internet in one day By creating the Best Hindi Blog list and today I wrote that post. For a brief explanation of your information, there was a time when Google Adsense did not see advertisements on Hindi blog, but nowadays Google Adsense acknowledged that people want to read in the Hindi language on Google and then display Google's advertisement on Hindi Blogs. Many bloggers today earn a great amount of money. Due to which a large number of people are coming in the field of Blogging. You will be happy to know that according to a report, most of the Hindi language content will be available on the internet by 2020. So if you want to start blogging in Hindi then this is the right time because the competition is going to grow in the coming times. Although there are many great Hindi blogs on the internet are available, we have added blogs to those bloggers in this list. On whose blogs numbers of people read every day and also earn millions of money. Therefore, the Best Hindi Blog List has been created keeping in mind the Alexa Rank. The bloggers who have blog's Alexa Rank have added the same blog to the Best Hindi Blog list. Founder Mayur of this blog who has contributed a lot to the promotion of motivational knowledge in the Hindi language through Blogging. Every person who comes to this blog gets motivated. In this blog. The founder of this blog is Gopal Mishra, who started his Blogging in 2010 by creating this blog. The target of this blog is to provide Valuable Content to its readers and their blog has achieved the target of 1 million Per Day Page View. This blog is based on many topics which provide information in Hindi such as closing, speech, writing, poetry, and festivals etc. It is a highly educated blog in India, which can be estimated by looking at its Alexa Rank. The founder has given very good effort to serve unique content. This blog was started by the famous Youtuber Manoj Saru in 2016. This blog is especially here that you can read Hindi articles and watch the video as well. He started his blogging and Youtube Channel laptop and used mobile to run the Internet and today he is a very big Blogger. Pawan Kumar, who is from Bulandshahr (Uttar Pradesh), started a Hindi blog in 2013, aimed at creating awareness among people about Hindi. Pawan Kumar is a very big blogger and his dream is that he wants to become a great scientist. Google did not get excited to write blogs in Hindi first, but now Google has made provision for broadcasting the advertisement in Hindi. So now more blogs are being viewed in the Hindi language. Hindi blog is also ranking in Google. Therefore, you should start writing blogs in Hindi as soon as possible.